What do you get when you have one half of the, "Sons of Sparda," the "Merc with a Mouth," and a "Flying Dragon?" The answer is a ton of damage. Watch a new proof of concept combo from Kane Blueriver inside. 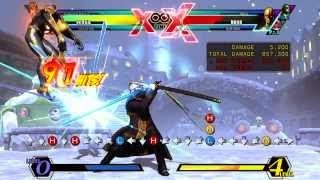 Kane Blueriver has posted a new Ultimate Marvel vs. Capcom 3 proof of concept combo titled, "Team Reichanman." Featured in the clip are Deadpool, Vergil, and Strider Hiryu. The combo produces over one million damage points.